Library of America’s LOA in the Classroom initiative provides high school social studies teachers and students with authoritative editions of classic documents and texts to anchor their study of the American past. With the generous support of our members and donors, select paperback editions are sent—free of charge—to thousands of teachers across the country. In 2017, in response to teenagers’ extraordinary interest in Alexander Hamilton inspired by the smash hit musical, Library of America placed more than 2,000 free copies of The Essential Hamilton, a compact edition curated with student readers in mind, in the hands of secondary school teachers of history and social studies in all fifty states. Enthusiastic posts lit up social media as teachers expressed excitement about how Hamilton’s own words helped engage their students during units on the Founding Era. In 2018, as high school students demonstrated a new commitment to democratic speech and political action following the devastating events in Parkland and elsewhere, LOA in the Classroom provided American Speeches: Political Oratory from Patrick Henry to Barack Obama to high school history teachers, social studies teachers, and speech and debate coaches nationwide. This collection of forty-seven essential speeches from the Revolutionary era to the twenty-first century focuses on watershed moments and themes in American history and the power of great oratory to effect change. LOA in the Classroom is part of Library of America’s broad mission to connect readers of all ages with the words and ideas that have shaped our nation. With your continued support, we can bring scrupulously edited and annotated primary source texts to more teachers and their students—free of charge. 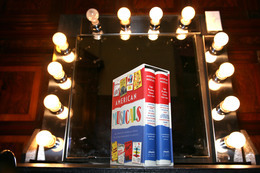 The New York City Department of Education purchased an American Musicals boxed set for each of the 240 city high schools with theater programs. Bravo! For adoption orders, Library of America is distributed by Penguin Random House, 1-800-733-3000. For inquiries regarding a book’s content please see the information available in our online catalog (under BOOKS, above), phone Library of America at 212-308-3360, or e-mail us at info@LOAacademic.org. To request desk or exam copies, please see the instructions posted by our distributor, Penguin Random House. In addition to making America’s greatest writing available to all, Library of America develops instructional resources and professional development initiatives that facilitate educational applications of this writing. In 2013, in partnership with Common Ground Environmental High School; Scholastic, Inc.; and the Gould Family Foundation, Library of America launched an education initiative for American Earth: Environmental Writing Since Thoreau to help teachers deepen students’ reading skills and comprehension while expanding their understanding of environmental issues. Edited by acclaimed environmentalist Bill McKibben, with a foreword by Al Gore, American Earth gathers the visionary American writing that has changed how we see the natural world and our place in it. Our free American Earth Teacher’s Guide aligns the rich texts in American Earth with Common Core standards and equips teachers to incorporate the texts into English, Language Arts, History, and Environmental Science courses. We are currently preparing a professional development program centered around this Teacher’s Guide that will train a national network of master educators to teach American Earth at the secondary school level. For adoption orders, Library of America is distributed by Penguin Random House, 1-800-733-3000. For inquiries regarding a book’s content please see the information available in our online catalog (under BOOKS, above), phone Library of America at 212-308-3360 or e-mail us at info@LOAacademic.org.